Melissa Lindahl (Blooming Enamels) is a self-taught, torch fire enamel jewelry artist living and working in Cleveland Heights. She has a master’s degree in Social Work and works full time in that field, but loves the magical nature of combining fire and glass. 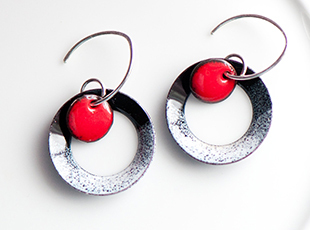 She creates enamel jewelry every chance she can. Melissa gathers inspiration by hiking and backpacking in the quiet simple beauty of nature and she often uses the colors she sees there in her work. Melissa has lived and traveled around the world and feels those experiences have enhanced her ability to be self-reliant, resourceful and creative. Melissa is supported in her work by her family and exuberantly affectionate rescue dog, Cooper.